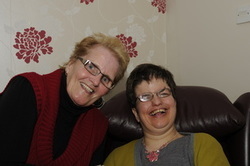 We aim to support carers of people with learning disabilities across north Devon. We understand the needs of carers and earn their trust so that we can deliver effective and valued services. In particular we offer support services to carers and carer groups that will help us reach vulnerable individuals and families who are often missed by other agencies. Information and advice - about all issues affecting carers, including benefits, breaks, respite and support services, carer assessment procedures, aids and adaptations. Emotional support - by providing opportunities for carers to talk through their concerns, both individually and in group sessions, with staff, trained volunteers and other carers who understand their situation. Community consultation - carers need a voice to ensure that they have an impact on decision-making. By consulting carers, we could help influence local policy. Practical help - befriending, breaks, transport, benefits advice. Training and education - in skills often needed by carers, such as moving and handling, first aid, and care giving; personal development; stress reduction through reflexology and aromatherapy; and training and education for professionals on carer-related issues.